Walt’s wife Sue & son Adam at plaque dedication. 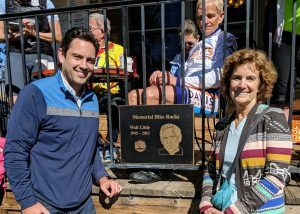 On Wednesday March 28th the Walt Little memorial plaque was unveiled in Winters. For those recent to DBC, Walt was a longtime member who seemed to be friends with everyone. Walt grew up in Winters, having the plaque in front of a popular cafe where cyclists park their bikes seems only fitting. A large turnout of cyclists and community members gathered for the unveiling on a beautiful spring morning.